AUBURN, Ala. – Every Alabama family needs to prepare for severe weather. In a single year, the gamut of extreme weather may range from tornadoes in the spring to violent thunderstorms and flash flooding in the summer to fall hurricanes and ice storms in the winter. The Alabama Cooperative Extension System has a new iBook to help families, businesses and communities prepare for storms and clean up after they pass. The Emergency Handbook is a comprehensive resource for emergency planning, preparation and storm recovery. It is available as a free download from iBooks. Alabama Extension Director Gary Lemme said this community resource guide was prepared specifically for Alabama by Alabama Extension in partnership with WSFA-TV. Chance Corbett, Auburn University associate director of emergency management added the Emergency Handbook will help residents be proactive in their emergency planning. “The best way to protect our families, our pets and our homes is by preparing ahead of time,” said Corbett. “The Emergency Handbook is built on Alabama Extension’s proven resources and augmented with material from FEMA, EDEN and land grant partners in other states. Kathy Carson, director of the Lee County Alabama Emergency Management Agency called the Handbook an exciting resource for citizens. WSFA-TV’s Chief Meteorologist Josh Johnson said some people might wonder why the Emergency Handbook is a digital resource. The Emergency Handbook contains more than 100 pages in four broad categories including People and Pets, Home and Business, Landscape and Garden, and Farms and Livestock. While Alabama Extension developed and refined much of the Emergency Handbook’s content, WSFA-TV’s team led by Johnson created graphics and short videos to add depth to the book’s overall content. 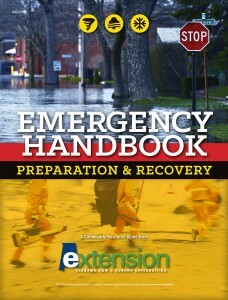 Lemme encouraged Alabamians to bookmark the Emergency Handbook website and to download the book to their iPads. The first section of the handbook is focused on advanced preparation so concerns about Internet connectivity and battery life are not as relevant. Johnson agreed people should use the handbook now to prepare. Lemme said that as Alabama Extension professionals develop new emergency preparedness and recovery information it will be added to The Emergency Handbook.